As you may have heard, we recently launched a kids collection, where we took some of our top-selling adult styles and made them available for the whole family! 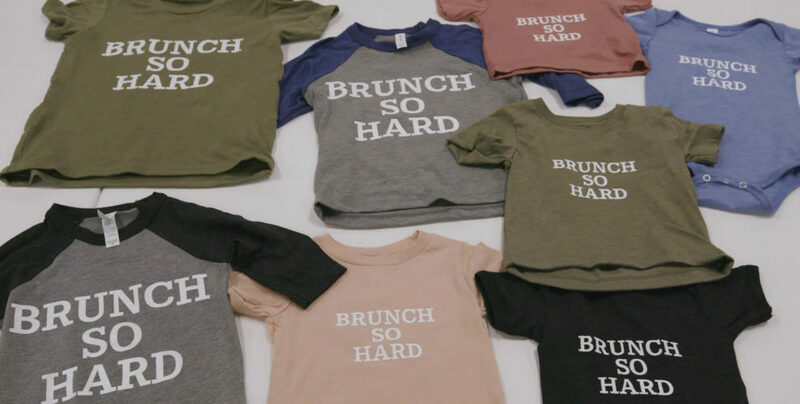 The fabric, styles and colors are all found in our adult line, but we know there are certain things that are important to keep in mind when screen printing kids apparel. So we teamed up with our friends at Shirt Agency again to go through a list of do’s and don’t for decorating on youth blanks. The main thing to keep in mind is that kids apparel shouldn’t be treated differently than any other job. If you’re looking for a nice print, screen printing is the way to go. Just keep in mind that you may need to test and adjust the artwork to make sure it fits appropriately on the small sizes. Discharge inks are really popular for adult apparel, because they look awesome. But be warned that if you’re interested in using a discharge ink on children’s blanks, you need to make sure you do it correctly. The chemical can cause skin irritations on sensitive skin, unless it’s handled properly. If you want to discharge on kids’ apparel, we recommend laundering and pressing the garment before the job is fulfilled to ensure the kids are completely safe. If you have any concerns about it, we say to err on the side of caution and stay away from discharge altogether. One very important factor to keep in mind when screen printing on kids apparel is to make sure you have the right size pallet boards. Even within our children’s line, we have baby, toddler and kids tees – meaning it’s a wide range of sizing. A common mistake by printers is to try to force a tiny shirt onto an adult board and will in turn stretch out the garment. If you plan on taking on jobs that include kids apparel, stock up on a variety of size boards. A good rule of thumb is to make sure you have a pallet board that is at least one inch smaller than the width of the chest of the shirt. We have a fit guide on our website where you can see the sizing of our garments. As many people are aware of, kids clothes and products have certain regulations they have to meet to ensure they are safe for infants and toddlers. At BELLA+CANVAS, we make it really easy to confirm that every single product complies with CPSIA standards that is federally required for infant and toddler testing and certification. On every product, you can find a tracking number for the General Certificate of Conformity (or GCC) for that specific item. The tag also includes a date, which refers to when that product was tested a third party lab, You can go on our website, plug that number in and download the certificate. We launched BELLA+CANVASKids, because customers vocalized a need in the market for quality kids’ wholesale. We kept that in mind when developing mini versions of some of our top-selling styles. As we mentioned above, we offer baby, toddler and youth sizes in styles that our customers already know and love. We use only 100% Airlume combed and ring-spun cotton, but we also offer triblend and flowy styles as well. You can start shopping the collection HERE! Hi Ashely! Thank you for sharing that you enjoy our blog. We hope you continue to learn more as new blogs are constantly being added. Let us know how we can help make this easier for you! How can we help?